We welcome you to our parish! Please contact the parish office at 317-257-4297 or email us to register. Stop by our Welcome Table in the narthex for information about Saint Matthew Church and School. Interested in Becoming a Catholic? 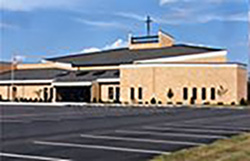 If you are interested in learning more about becoming a Catholic or want to join the Catholic faith, please contact Jeni Lengerich Pleiss at the parish office.